If you are having trouble with your worm composting bin, this troubleshooting guide will help you find the solution. Copy the below code to Share this Infographic On Your Site. Please include attribution to www.wormcompostinghq.com with this graphic. Cover all food scraps with several inches of bedding. Build a fruit fly trap. Worm bin started too wet. Mix in dry worm bin bedding. Spray worm bin with spray bottle of water. Add several sheets of soaked newspaper to the top of your worm bin to act as a moisture blanket. Extremely bad conditions inside bin. This is rare. Correct bin conditions. Worms will only leave if things get really bad. See other solutions. Shine light on bin to encourage worms to burrow in bedding. Extremely bad conditions inside bin. This is rare. Way too wet, way too dry, no food. Extreme temperatures: way too hot, way too cold. Outdoor worm bin with exposed food scraps/overfeeding. Cover all food scraps with bedding. Do you have a worm composting problem that is not covered? Please let me know here so I can answer it and others can benefit as well. If you found this guide helpful, please tell a friend. Thanks! 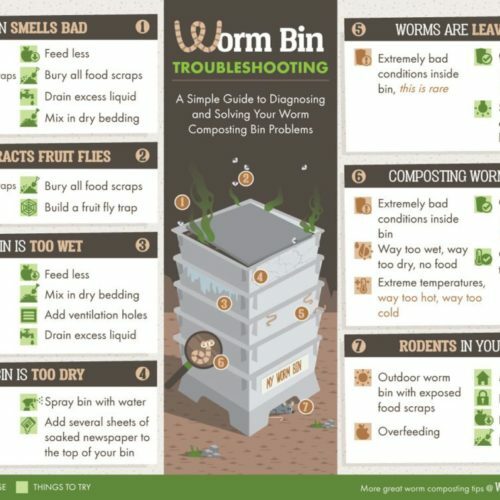 Worm Bin Troubleshooting Infographic now available as a fridge magnet or sticker to slap your worm bin. Check it out!